A parrot in Chandrapur, Maharashtra, was detained by police on Tuesday after an old woman filed a complaint against it for making obscene remarks at her. Janabai, who is in her 80s, filed the complaint with the police in Rajura city of Chandrapur District, saying the parrot had been tutored by its owner to shower abuses at her whenever she passed by his house. The parrot, named Hariyal, is owned by Janabai’s stepson Suresh. A complaint was also registered against him. Both live separately due to a property dispute. “I am being harassed for the last two years. On seeing me, the parrot uses bad language and foul words. That is why I have complained thrice in the last two years. Police called me, Suresh and the parrot to the police station. Police should investigate and seize the parrot,” said Janabai. The police had called the agitated woman, her son and the parrot to the police station to verify the complaint. 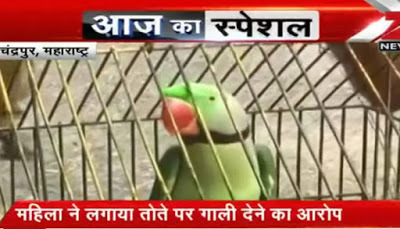 However, the police said the parrot did not utter a word when his cage was brought near Janabai at the police station so no ‘charges’ were pressed against it. As there is no law to imprison a parrot, the police officials handed it over to the forest department officials.